Snowshoe WV Ski Rentals DISCOUNT! Let’s face it – skiing and snowboarding can be an expensive hobby! Of course, the fun and excitement of racing down the mountain makes the expense totally worth! However, most families still look for ways to save a few bucks here and there. 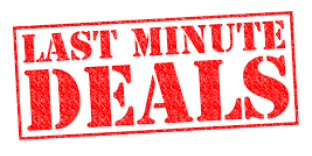 Mountaintop Condos is constantly looking for ways to save our guests time and money – and we’ve got a deal on Snowshoe WV ski rentals! 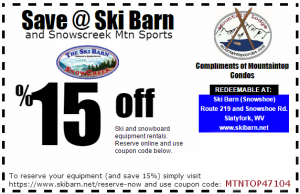 We’ve teamed up with the Ski Barn – located near Snowshoe WV – to offer our guests 15% off of Snowshoe WV ski rentlas and snowboard equipment. 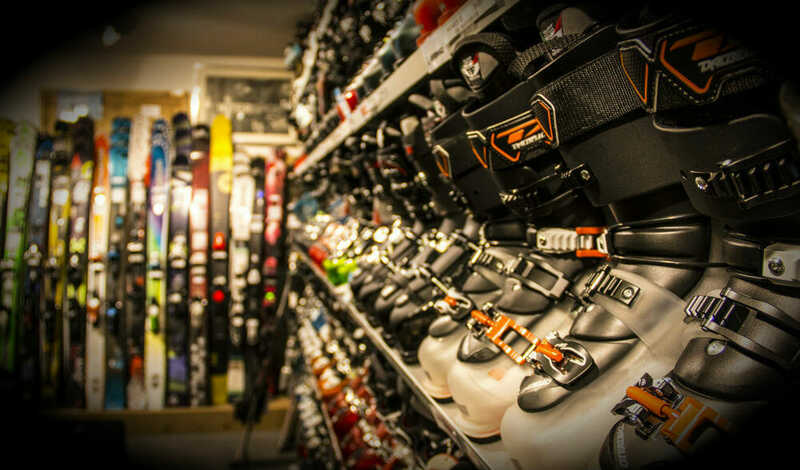 Our discount is valid at both of their Snowshoe WV locations, and is our recommended method for saving a few bucks during your trip to Snowshoe. The Ski Barn is located at the bottom of the Mountain, while their sister store – Snowcreek Mountain Sports – is located mid-mountain near the entrance to Silver Creek. Feel free to use our discount code (MTNTOP47104) at either location. To take advantage of these Snowshoe WV ski rentals, simply visit https://www.skibarn.net/reserve-now and use coupon code MTNTOP47104 when making your reservation. Online reservations must be made 24 hours prior to arrival to qualify for the 15% discount. I have a reservation I made for Booking.com on 11/16/2018 to 11/18/2018 for two nights in the name of Yanko Ojeda, my husband at the Mountaintop Condo hotel, Snowshoe. I want to know if on that date the ski slopes are available, because when I put the option to buy an activity or a lesson it tells me that there is no date for that exact date.